Electric vehicles are now a more common sight on our roads, with Government ministers saying they are committed to making the UK a “world leader in the electric car industry”. The significantly lower running costs compared to petrol or diesel vehicles makes electric vehicles a much ‘greener’ transport option. 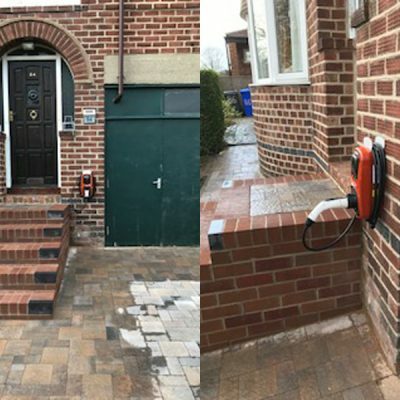 Looking to get an electric vehicle charging point installed in your home? 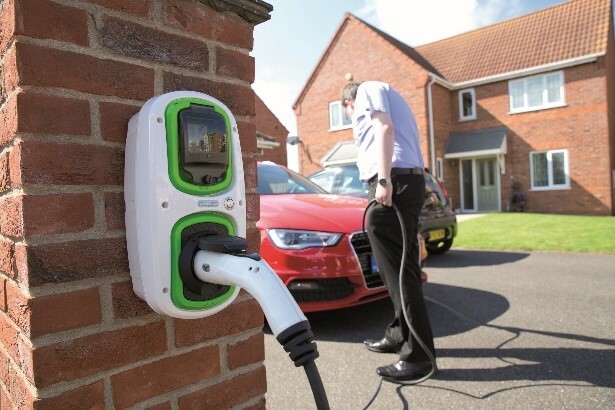 If you use an electric vehicle, you could be eligible for the OLEV grant, helping you towards the cost of an electric vehicle charging point installed at your home. Charging your vehicle at home overnight is very convenient and a dedicated home charging kit ensures you charge your vehicle safely and more efficiently than if using a standard home socket. A home charging kit is a wall mounted unit connected to the electricity supply for your house, usually situated in the driveway or on the garage wall. We have fitted a large number of electric vehicle charging points for homeowners across Yorkshire. The Office of Low Emission Vehicles (OLEV) grant is available through Norcroft Energy (subject to any changes in OLEV funding). The current grant offers 75% towards the cost of an OLEV approved Home Charging point up to a maximum of £500. Who is eligible to access the grant? Individuals who are assigned a company car for at least six months on or after 1 October 2016. Individuals who lease an eligible vehicle for at least six months on or after 1 October 2016. Individuals who have leased the vehicle as part of a salary-sacrifice scheme from 1 October 2016 onwards. Individuals who are named by their employer as the primary user of an eligible electric vehicle for at least six months on or after 1 October 2016. If the named individual changes within six months, a second grant cannot be claimed. Individuals who can prove that they have ordered an eligible electric vehicle and the vehicle will be received on or after 1 October 2016. Individuals who have taken keepership of a new or second hand eligible electric vehicle on or after 1 October 2016 as long as they have not claimed against the previous charge point schemes or can evidence keepership of two eligible electric vehicles. Properties with off street parking where a charge point can be wall mounted. Eligible electric vehicle in accordance with OLEV’s vehicle eligibility list. The contribution payable by the customer will be subject to a site survey, location and OLEV Terms & Conditions. Please click here to view OLEV’s full Terms & Conditions. What does the OLEV domestic charge point installation include? A maximum run of 10 metres from source of supply (consumer unit) to charge point. The property’s consumer unit must be RCD protected and have a spare way for protecting the outgoing charge point circuit. Cable to be surface mounted – clipped direct. The property must have an earthing arrangement complying with current regulations. The charge point must be fixed to the main property and able to utilise the property’s earthing arrangement. The homeowner must comply with all current OLEV Domestic Scheme Terms and Conditions. Any installation work required outside of the above criteria will be quoted for during the pre-installation site survey. There may be additional reasonable charges for non-typical installations such as, but not limited to, long cable runs, improvement to earthing arrangements, difficult time-consuming installation work or excessive travel. The connectors required are dependent on the model of electric vehicle. If the leads are purchased separately they are available in 5m or 10m lengths, please ask for further details. To find out more or to request a site survey, please contact us on 01226 763127. Why do I need a dedicated charging unit? Safety and speed. A standard 13amp home socket is not designed to withstand the electrical load required to charge an electric car. Electric vehicle charging units are specifically designed to safely charge electric vehicles. With a dedicated charging point, your vehicle will charge much quicker, saving you time and money. How long will it take to charge the vehicle? Using a standard 13 amp domestic socket will take approximately 5 hours for a full charge. By using a dedicated EV charging point that supplies 16 amp a full charge will take approximately 3.5 hours. A rapid charging point will charge the vehicle in 30 minutes, to a maximum capacity of 80%. How much will it cost to charge the vehicle on my dedicated 16amp power supply? The actual cost depends on the energy supplier’s tariff. Tariffs can be considerably cheaper during the night and if the vehicle’s charging timer is used in the cheaper rate hours this can reduce the charging cost significantly. Can I charge my vehicle using a 32 amp charging unit? Some electric vehicles can only accept 16 amp charge. So a ‘fast’ or ‘very fast’ charge using a 32 amp supply, or a ‘rapid’ charge using a 63 amp supply will still only deliver a 16 amp charge, if that is the maximum that the vehicle can accept. What if I don’t have off-street parking? If you don’t have off-street parking, unfortunately we won’t be able to install a charging point at your property. There are alternative options available to you and we recommend you contact your Local Authority who will be able to assist. I have more than one electric vehicle at my property. Am I eligible for two charging units? Yes, you can have a charging point for each eligible vehicle at your property. How much paperwork is involved to apply for the OLEV grant? We will support you with the process. An EV charging point is a good selling point for your property. Should you wish to take the charging point with you, you can apply to the OLEV for permission. What is the lead time if I go ahead with the installation? Usually around 1 to 2 weeks but sometimes 2 to 3 days, subject to location and installer availability. Installation will usually take around 1-2 hours depending on how standard the install is. However, we will visit your property to do a pre-installation survey first, to check your electrical supply meets our installation criteria. At this time, we will be able to advise the time it will take to install and agree a suitable date for installation. Are there different colour options for the charging unit? Not on the grant scheme. I have not been in possession of my vehicle for the minimum 6-month period and I am no longer in possession of my vehicle, what should I do? You MUST inform OLEV immediately via Chargepoint.Grants@olev.gsi.gov.uk as your declaration has been invalidated. If the VRN of this vehicle is used by the next owner to claim a chargepoint, the vehicle will be flagged as a duplicate. If you have not informed OLEV of this change, we will investigate and, where appropriate, take any steps to reclaim the benefit. I am VAT registered. Can I put it through my company’s accounts? No. The grant is for private individuals only who will not reclaim the VAT back through HMRC. The grant covers 75% of the total cost including VAT, up to £500.